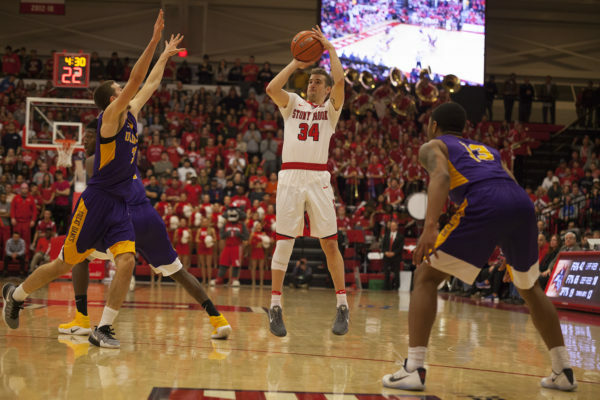 Stony Brook Men’s Basketball had a chance to regain momentum before halftime after Albany guard David Nichols hit a three to push the Great Danes’ lead to five. Senior guard Lucas Woodhouse cut to the basket and tried to lay it up high. It missed. Redshirt freshman forward Alonzo Campbell gathered the offensive rebound and laid it up. Again, a miss with just seconds on the clock. The ball found its way into the hands of Great Danes forward Greig Stire who pushed it upcourt to a sprinting Costa Anderson. The Albany guard heaved the prayer from well beyond the three-point line. Swish. It was the beginning of the end for the Seawolves, who lost the America East semifinal game on Monday night, 63-56. It was the first time the team fell to Albany this season. Anderson’s three started a flood of scoring for Albany. The sophomore guard duo of Joe Cremo and Devonte Campbell went on a tear, extending the team’s lead to 13 early in the second half after a 7-0 Great Danes run. But the Seawolves kept true to their motto of “keep chopping wood” and rallied back. Stony Brook forced four consecutive turnovers to cut the deficit to three points with 13:30 on the clock. Redshirt freshman forward Akwasi Yeboah finished off the 10-0 scoring run with a corner triple. 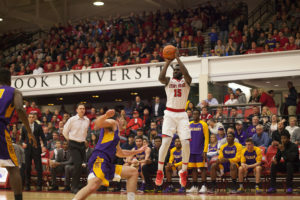 But Albany would pull out to an eight-point lead after Stony Brook went into a scoring drought after Yeboah’s three. Although Woodhouse tried to get the Seawolves back into the game, scoring eight points in the final seven minutes of the game, the Great Danes took advantage of the free throw line, shooting 8-for-10 from the charity stripe in that same period. Albany shot 21-for-25 for the game from the foul line, while Stony Brook went 16-of-24. The game was an emotional one, but that is to be expected in a rivalry as heated as this one, especially in a playoff atmosphere. Boals received his first technical foul of his entire coaching career, reacting to redshirt junior guard Roland Nyama’s hard foul on Cremo after attempting to trap the sophomore guard during Albany’s 7-0 run in the second half. Albany head coach Will Brown passionately yelled at the referees after each of his team’s fouls. It was a back-and-forth affair in the first half. While the Great Danes got out to a three-point lead early in the half, Woodhouse, Yeboah and junior forward Junior Saintel led the charge for the Seawolves, taking over with a three-point lead of their own midway through the period. Woodhouse led all scorers with 25 points on the night. He also tied the program’s single season assist record with 158 on the year after recording three during the game. With the news of UMBC receiving an invitation to the College Invitational Tournament, it seems likely that Stony Brook will also participate in postseason play. But until an invite from the College Invitational Tournament or the like emerges, the Seawolves’ season is over.